Neil De Koker, retiring CEO of the Original Equipment Suppliers Association. Tougher federal fuel economy and emission standards have forced the Detroit 3 to embrace suppliers that have developed cutting-edge technology, and Neil De Koker is delighted about it. This fall, De Koker is in the process of stepping down as CEO of the Original Equipment Suppliers Association, the trade group he founded 15 years ago. With 450 member companies representing $300 billion in annual sales, OESA arguably has become the voice of North America's automotive suppliers. Yet De Koker, 70, ruefully notes that he is still wrestling with some of the same issues—such as one-sided purchasing contracts—that he did when he launched OESA in 1998. In a recent interview with special correspondent David Sedgwick of Automotive News, a sister publication of Rubber & Plastics News, De Koker looked back on his 50 years in the auto industry. What were the big issues when you launched OESA? So most suppliers didn't know that some vendors were negotiating a better deal with auto makers? It made us aware that some suppliers stand up to their customers to demand reasonable treat-ment. It was a serious epi-phany—it really was. Do you believe that some auto makers' purchasing contracts are one-sided? We developed a model contract. We asked ourselves: If the relationship between buyers and sellers were equal, what would a standard contract look like? We had a team of 47 people that worked on a model contract for 18 months. How did the auto makers react? That must have been a tough blow. At the end, three OEMs said they'd come to the next meeting, but I was devastated that there wasn't enough interest in the industry to save us all kinds of money. We had concluded that there was $10 billion wasted every year just because we couldn't agree (on contract terms). With that in mind, have relations between suppliers and auto makers gotten any better? There is more cooperation. I've seen some really, really good things recently. At Chrysler, they put the chief of engineering (Scott Kunselman) in charge of purchasing. 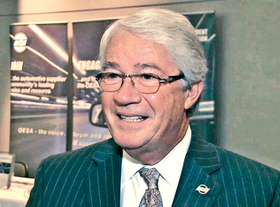 Integration (of engineering and purchasing) at Chrysler has improved dramatically. So is it a good sign that the Detroit 3 are putting engineers in charge of purchasing? Absolutely. You've got Hau Thai-Tang at Ford, so they're doing pretty good. And it's the same thing with Grace Lieblein at General Motors. And in September, she started reporting to Mary Barra (GM's chief of product development). How would you compare Toyota and Honda to the Detroit 3? I think those companies perceive purchasing as a service to help suppliers, whereas GM, Ford and Chrysler were fiefdoms in the old days. Their purchasing chiefs were called czars—and not affectionately, I might add. I think that's changing, now. Why are the Detroit 3 changing now? I think it's because of the federal mandates for better fuel economy and emissions. The challenge is so great that it's more important than ever to coordinate purchasing and engineering. You told me about your failure to win support for a model contract. But what was OESA's greatest success? We've made progress in a number of areas. We developed these town hall meetings, (when OESA would sponsor annual meetings between an auto maker's purchasing chief and its suppliers). The first town halls were in 2002 with Ford and GM. Their purchasing staffs have participated in meetings where we had 300, 400 and even 500 supplier executives in the audience. Clearly your biggest crisis was the crash of 2008 brought on by the collapse of Lehman Brothers. Suppliers were on the edge. Sales volumes were so low. They were barely surviving. They were cutting costs like mad, and the banks weren't lending them money for working capital. The biggest thing was to convince the government that if one auto maker were allowed to go bankrupt, then hundreds of suppliers would go bankrupt, and up to 2 million jobs would be lost. So you educated the government. But suppliers needed financial aid, too. It was the ultimate cash-flow crisis. We needed loans that we could apply against receivables. (The accelerated bankruptcies of GM and Chrysler) saved the industry, but we still had 61 suppliers go through bankruptcy. How does the industry look now? We're getting more and more global. The number of suppliers with a presence in China is amazing. And suppliers have a presence in places like eastern Europe, India, Russia. You can't just say: “I'm happy in North America; I'll just stay here.” Because you won't be able to meet your customers' expectations.